While my days have fallen into a somewhat predictable routine, I can honestly say every day feels slightly different. For example, this post was due to go up yesterday, and it would’ve been all about our Tuesday. However, I was EXHAUSTED on Tuesday. I blame the fact that I got more sleep than usual that night. My mind and body aren’t used to anything more than six hours! Anyways, even though we pretty much did the same things on Tuesday and Wednesday (the main difference being a visit from my sister on Tuesday), the latter just flowed a lot better. And I was waaaay more energetic! 5:00 am – Our human baby alarm wakes us up, and he’s hungry! Vishnu offers to feed Kaiden so I can power pump. 6:00 am – Kaiden’s fast asleep again. After I finish pumping, I make Vishnu’s lunch (turkey + cheese sandwich and apple slices). 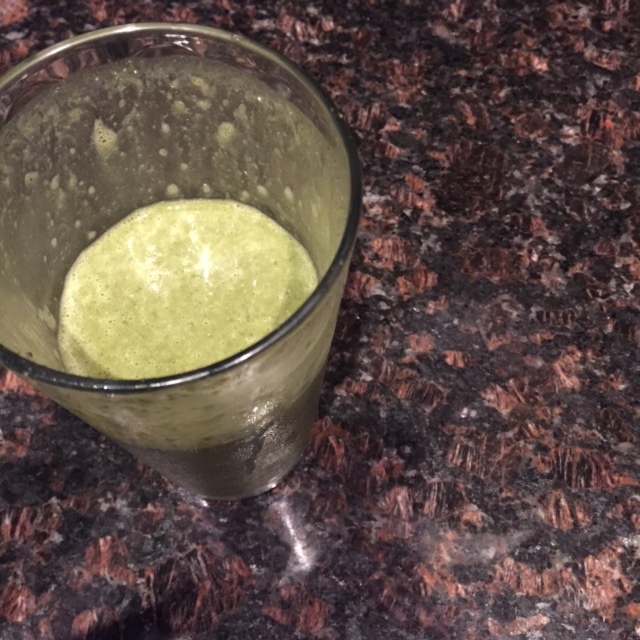 I then make our breakfast protein shakes and chat with Vishnu until it’s time for him to leave for work. 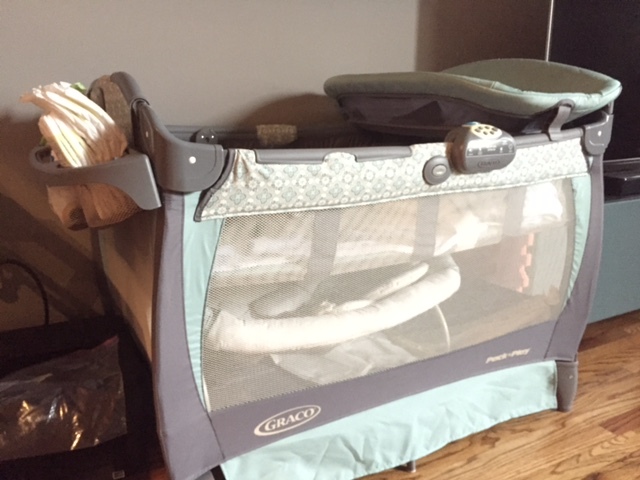 7:30 am – I hear some noises coming from the bassinet, so I wake up and soothe K until he falls back asleep. I try to fall back asleep but can’t, so I text with friends and look up random baby related stuff online. 8:00 am – It’s time to pump again. Thanks to my DIY hands-free pumping bra, I’m able to continue texting and then eventually call my mom. 8:45 am – K is up again, so I feed and change him. 9:15 am – Kaiden’s in a playful mood, so I put him down in his Pack n’ Play and do some laundry (oh so much laundry these days!). 10:20 am – K goes down for nap #1 of the day. I take this time to eat breakfast #2 (two slices of toast + PB). I swear breastfeeding/pumping hunger > pregnancy hunger! Surprisingly, I have time to fold and put away laundry. 11:15 am – Kaiden is up from his nap! We play for a bit until he’s ready to eat again. 11:50 am – Time to eat. Also, time for another much needed diaper change. 12:15 pm – Time to pump again. This session is a bit tricky because Kaiden’s still up. I manage to entertain him well enough to the point where I can finish pumping without stopping. Phew! 1:00 pm – Time for nap #2! During this nap, I manage to squeeze in a 40 minute Barre3 Online workout. I LOVE LOVE LOVE Barre3 and plan to share in an upcoming post more about why I think it’s the perfect workout for new mamas (and anyone really!). 1:50 pm – Kaiden’s up and a little cranky. Nothing a little song, dance, and farting noises can’t fix! 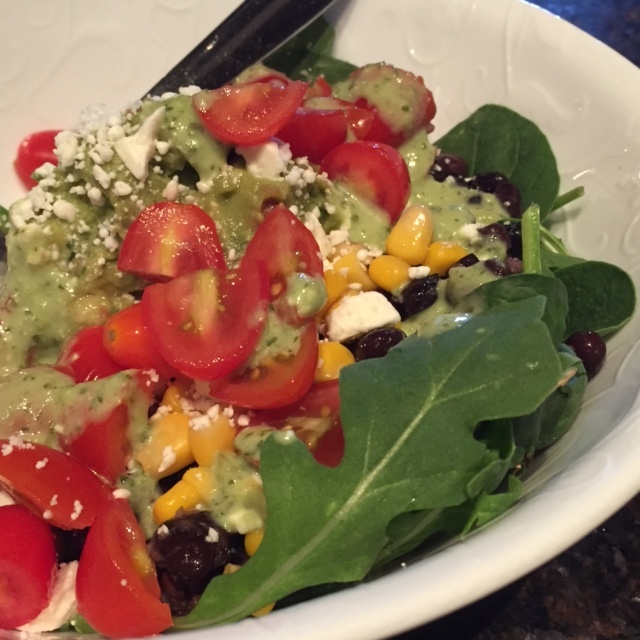 I somehow manage to fit in my own lunch at this time (a super delicious Tex Mex type salad). 2:45 pm – I feed Kaiden, which automatically puts him in a better mood. We then read books, sing songs, and play peek-a-boo until Kaiden’s sleepy eyes appear again. 3:45 pm – My king goes back down for his 3rd and final nap of the day. 3:50 pm – I’m hungry again, so I snack on some grapes. 4:30 pm – I figure I have 15-20 minutes before K is up from his nap, so I do more laundry, spot clean, and send an email. 4:50 pm – Sure enough, Kaiden is up from his nap and ready to party! 5:20 pm – Vishnu’s home!! He immediately washes his hands and scoops Kaiden up. The two of them play while I finish up some random tasks around the house. 6:00 pm – I feed Kaiden while Vishnu eats dinner (leftover Instant Pot butter chicken and rice). 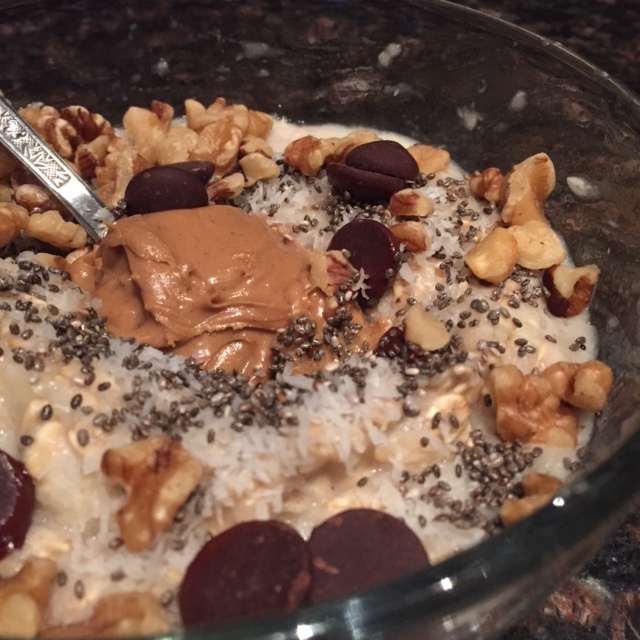 6:15 pm – Vishnu and I switch roles so I can eat dinner (the ultimate bowl of banana oatmeal (minus the egg) topped with unsweetened coconut flakes, walnuts, chia seeds, chocolate chips, and PB…my fav!). V changes K’s diaper and cleans him up before putting him down to sleep. 6:30 pm – Vishnu and I relax on the couch and catch-up a little. 6:45 pm – We tag team a few tasks (me – dishes, Vishnu – putting on the duvet cover). 7:45 pm – I go back to the kitchen to wash all of K’s bottles and my pump parts. 8:05 pm – Time for mama to shower. I take an extra long one because…well, I deserved it! 8:45 pm – I sit down to write this post. 9:30 pm – I crash on the couch and close my eyes. The exhaustion that was missing at the beginning of the day is now hitting me! 10:00 pm – It’s time for my final pumping session. THANK GOODNESS! 10:45 pm – I’m in bed fast asleep! And that is a very detailed look at our day at 3.5 months. Our little baby is growing up! Another reason for the detailed post is that I go back to work in 2 weeks and 6 days (who’s counting?!). I don’t think I’ll share another post like this before then, so it was even more important to capture all the tiny things. As you all know, I love to go back and read old posts…especially my day in the life ones…and even more so, the ones about/with Kaiden! With that, have a GREAT Thursday!